As students come to know the wild creatures that share their space, they’ll discover that, although such places provide sanctuary, they also need our protection, whether they are tiny, personal, wild spaces or large parks and officially protected areas. We begin by helping students make connections to small, local spaces that are special to them and to wildlife. Then we extend the concept, helping students discover places that are regionally, nationally, or even globally special for wildlife. Note: In this unit, wildlife is defined as all non-domesticated living organisms. It includes vertebrate animals (mammals, birds, fish, amphibians, and reptiles), invertebrate animals, vascular plants, algae, fungi, and all other wild living organisms. As students move through the lessons, they produce artwork, writing, and other pieces that communicate about and celebrate their special wild spaces. These provide the materials for an exciting, culminating event in which the students play a strong leadership role using the organizational aids we’ve included here. 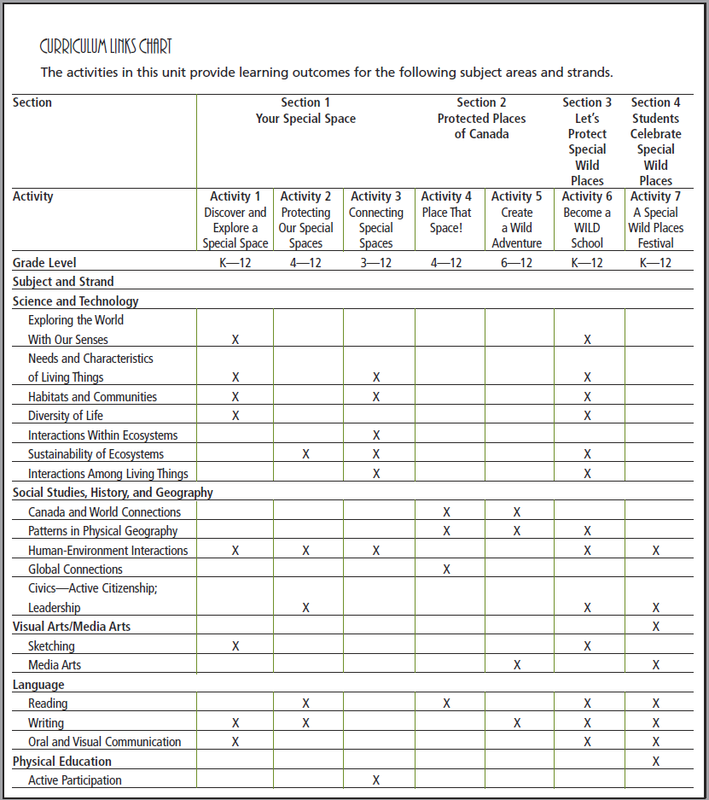 Hands-on, student-centred activities from Kindergarten to Grade 12. Themed lesson plans that provide background information and are curriculum-linked, classroom-ready, and fun. All activities may be used for a culminating event such as a celebration or festival. In this section, we will help you facilitate a process for your students to discover their own special wild spaces in their immediate world, and to explore their relationships with them. We’ll also explore the concept of “space” as one of the four habitat needs that all animals, including humans, must meet in order to survive. People who spend time outside in a natural setting develop a greater connection to their natural environment and a life-long sense of caring for it. Students take a field trip into the schoolyard or a local park to find their special wild space and begin to get to know it. Students use observation and structured activities to develop a relationship with the space and record their observations, thoughts, and feelings. This is a physically challenging team game in which students role-play a wild animal and work to connect four wild spaces that represent the animal’s key habitat needs. This section serves as a transition for students. Here, they learn that sectors of society have their own special spaces and recognize the need to protect them. Wild areas are essential for maintaining biodiversity at all levels (genetic, species, and ecosystem). Lesson Plan: Place that Space! Students do Web-based research to complete a quiz by matching the descriptions of 13 Canadian protected areas to the province or territory where they are found. This activity leads students to research a trip to one of Canada’s protected areas. Though we all value and protect special wild places, we often forget about them in the quest to meet our own daily needs. This section will help students understand the need to protect the areas they value and take action to do so. It includes suggestions that tie into CWF’s Habitat 2020 program. Here are some of the things that can happen to special wild places in our own neighbourhoods. In this section we pull it all together. This is where the students “show and tell” the community and the world what they have done and learned through their activities. Each of the previous activities in this teaching unit will produce student projects, displays, and shows all the “fixings” for a great celebration or festival. Read on for tips on how to create an opportunity for older students to develop leadership and teamwork skills, while minimizing demands on your time at busy year-end. A festival or celebration is simply a collection of activities, displays, and presentations with a common theme. A student’s special wild space can be defined on a personal level that depends on his or her values. A simple reflective process helps students deepen their connection to their special wild space. Students want to protect what they care about. Working together, people can protect wild spaces unofficially through their own actions or officially through designation, regulation, and management involving non-government and government organizations. People must protect the integrity of special wild spaces to maintain genetic, species, and ecosystem biodiversity. Protected areas provide essential habitat for wildlife. Protected areas are also necessary to maintain essential ecological functions such as water and nutrient cycles. Protected areas are important to people for recreational, cultural, and spiritual reasons. Protected areas and their wildlife are threatened by human activities, including pollution, litter, and development. In Canada, special areas are protected at a variety of levels and through a variety of approaches (local to national, private stewardship to federal government, wildlife sanctuary to recreational park). People of all ages can enjoy Canada’s protected areas by visiting them personally or virtually (e.g., through magazines, books, and the Web). People of all ages can act to protect special wild spaces in Canada; protection begins with shared awareness and celebration.